Discussion in 'Apple iPad News' started by iDan, Apr 8, 2010. PopCap Games has just released an HD iPad version of its massively popular and multi-award winning iPhone game Plants vs. Zombies, and it looks like itâ€™s proving to be just as big a hit on the iPad as it was on the iPhone, with many customer reviews citing it as a must-have purchase and one of the best games on the iPad so far. Since the game first appeared for the iPhone/iPod touch back in February of this year, it has sold more than 650,000 units, and justifiably so. If you love Tower Defense games with a botanical twist, this is the app for you! 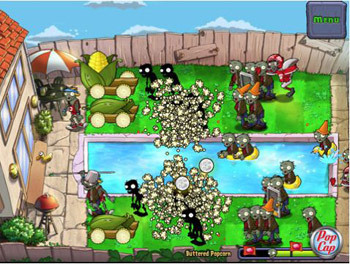 The Plants vs. Zombies HD app for iPad includes all 50 levels of Adventure and QuickPlay modes, as well as Survival mode from the original Apple Macintosh and Windows PC game. Four new achievements and 18 new mini-games have been added to the iPad version, including the Buttered Popcorn mini-game which is completely exclusive to the iPad, in which you attack zombies by first â€œbutteringâ€ them up, then fire corn-cob cannons at them. The iPadâ€™s Multi-Touch user interface enables players to select up to eleven zombies at a time as targets for buttering. And all of that beautiful buttering action can be seen in full 1040x768 resolution of course! Fun game. It looks great on the iPad too. I played it a little bit at the Apple Store, and, while it was fun for a few minutes, it seemed geared more towards casual players. I did enjoy the game in my brief time playing it, I think it's well-done and the graphics are nice. But I have to say, I think it's overpriced at $9.99. I don't want to derail the thread, but it got me started on a little rant I split into a separate topic here. Yeah, I've been wanting to try it since it seems to be a really addictive game, but I can't bring myself to pay $10 for it. Wow you guys are cheap! =) It's well worth the $10. Played this on the pc, and bought it for the ipad but haven't had a chance to play it on my ipad yet, hope it's worth the $$. It's a great game on the PC and the iPhone. Since I already own it on both I'm gonna hold out till it drops in price a bit. There will be a special on it once the new wears off. I own it already on PC too, and it is definitely worth it. Popcap makes such great use of games that work well on devices like PDAs and phones, and this one is ideal for the IPad. but if you like the tower defense style, you will definitely get your moneys worth out of it.